High Rocks is privately owned and there is an entry fee that needs to be paid at the lower bar before entry. The venue is mainly used for functions and weddings but is also open to climbers and the general public. The current climbing access is in a fragile state, and local activists and the BMC have been working hard to secure future access for climbers. Please respect the owners wishes and be polite to staff if asked to show your ticket or if asked to move away from wedding parties. 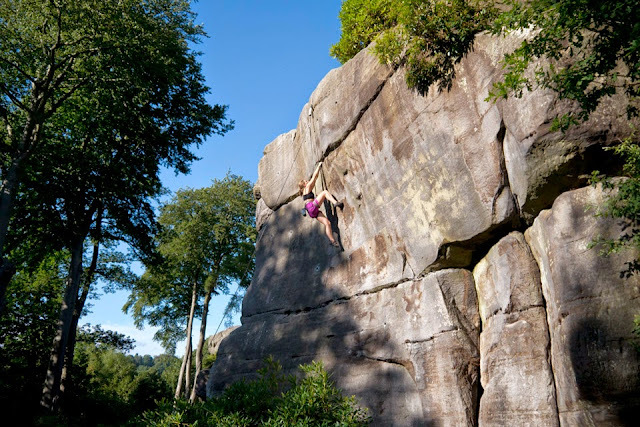 Extra restrictions have been put in place and we need to all set a 'good example' to the landowner that climbers can cooperate and peacefully climb at High Rocks, as this is vital to ensure access is maintained so we can continue to climb in this beautiful location. Rock climbing is by appointment only. Give them a call first to avoid disappointment, as weddings could be taking place and you may be refused entry. (Tel: 01892 515532). Please check the High Rocks website as access arrangements are updated frequently. Entry for climbing is £10 per day, discounted to £6 if arriving after 5:30pm. As far as we are aware they are no longer selling yearly memberships. Tickets must be purchased at the lower bar on arrival. Entrance is through the garden gate. On Fridays, Saturdays, Sundays and bank holidays all climbers (roped climbing only), must arrive before 11:30am or after 5:30pm. This is due to wedding parties on site. Roped climbing permitted Wednesdays to Sundays & Bank Holiday Mondays at the stated times above by appointment (Please give them a call first to find out if any weddings are taking place). This includes and is not limited to: 'Boonoonoonoos', 'Celebration', 'Nemesis' and 'Odin's Wall'. Please also note the open area is restricted. Ropes should be removed and the area left clear for photographs.